My mom sent me home with a big bag of frozen raspberries she picked from her backyard. They had unthawed some on the drive home and (not thinking) I popped them back in the freezer where they turned into a big solid lump. I needed 1 cup of raspberries for the marsala sauce, so I took the bag from the freezer and gave it a solid smack on my countertop to try and break the lump of raspberries apart. As soon as the raspberries smashed down on the counter I covered my face with my hands and started swearing oh f**k, oh f**k, oh f**k. It wasn't my counter I smacked; it was my glass stovetop. I peered between my fingers like a kid at a scary movie to find a giant hole in the middle of my stove. Can you even believe how brilliant I am?! Even more super awesome is that I have 9 guests coming over for dinner at the supper club on Friday and another 10 on Saturday and the replacement glass is on backorder and won't be here for 3 more weeks. Wish me luck cooking an 8-course meal on a camp stove! As they say, “What doesn't kill you gives you a good story to tell” or something like that. So back to the recipe. This raspberry marsala sauce is where it's at. It's tangy and fresh and perfect for summertime. It has a strong raspberry flavour, and the marsala adds just the right amount of booziness and sweetness. If you like raspberries, you will love this sauce. 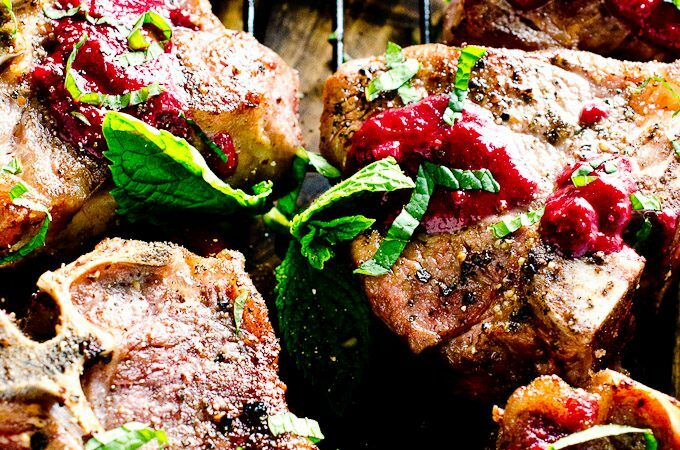 If it's too hot in your house to turn on the stove – or you've smashed yours with a bag of frozen raspberries – the lamb would also be delicious cooked on the BBQ. The best way to cook tender lamb chops is to sear or grill them. Start with a super hot pan. To get a dark sear without overcooking the lamb, you need a very hot pan. Cast iron works best. Season the lamb chops generously with salt and pepper just before they go in the pan. If you season them and then let them sit the salt will draw moisture to the surface, and you won't get as nice of a sear. Sear the lamb for 3-5 minutes per side, turning once. 3 minutes per side for medium-rare and 5 for medium. Don't serve lamb chops rare; it doesn't do them justice. Rare lamb chops will be slippery and rubbery. If you cook them to medium rare they will be tender and have much better texture. 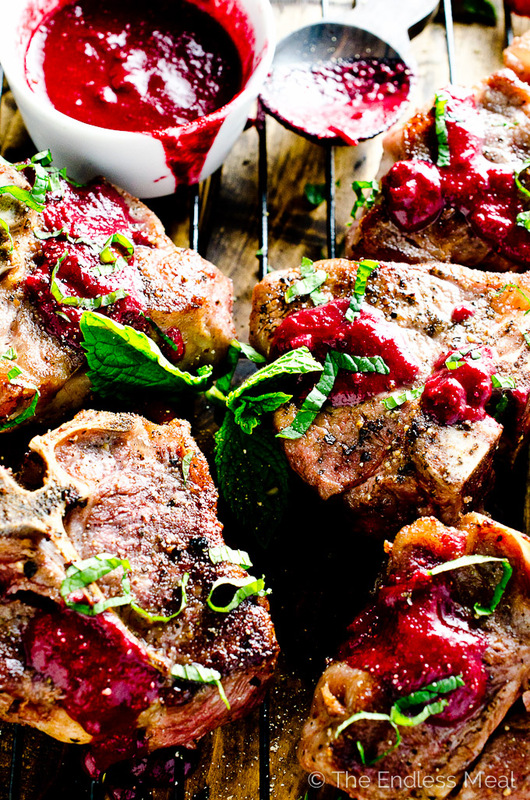 Let the lamb chops rest for 10 minutes before you serve them. Disclaimer: the lamb in these pictures is not seared to perfection. After my kitchen disaster, I tried to sear them in a cast-iron pan on my BBQ but it wasn't hot enough. You want a dark sear like you can see in a few of the corners of the lamb chops. 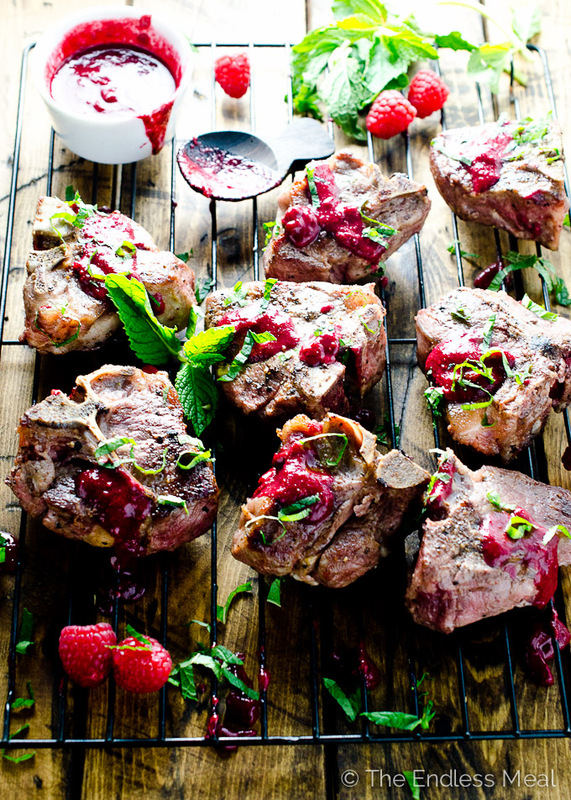 This tangy raspberry marsala sauce is the perfect compliment to tender, seared lamb chops. Try it over chicken or salmon for delicious summer meal. Place the raspberries, marsala, honey and garlic clove in a blender or food processor and blend on high until smooth. Season the lamb chops with sea salt and fresh cracked pepper on both sides. When the pan is hot, add the oil then immediately add the lamb chops. Sear the lamb for 3-5 minutes then turn it over and sear it for another 3-5 minutes on the other side. (3 minutes per side for medium-rare, 5 minutes per side for medium.) Remove the lamb from the pan and reduce the heat to medium high. Add the shallot to the pan and cook, stirring constantly, for 2 minutes. Add the raspberry marsala sauce to the pan and let it boil rapidly until it begins to thicken, 3-5 minutes. 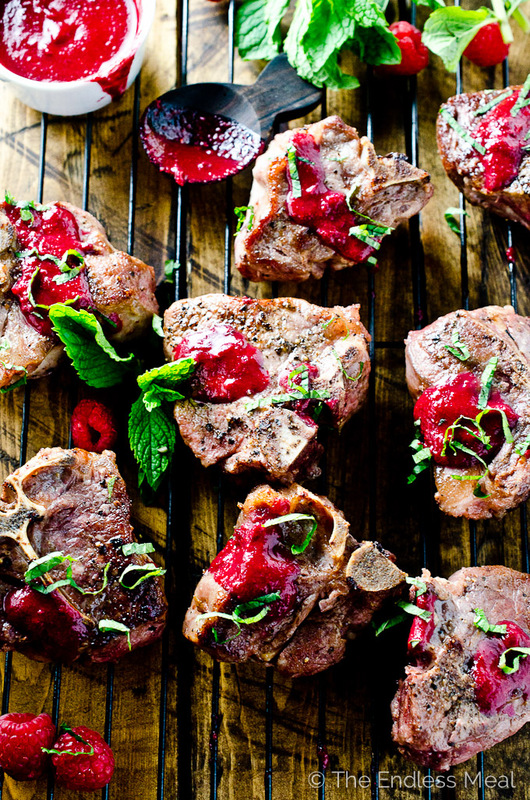 Serve the lamb with the sauce overtop, some chopped mint and extra raspberries. Oh my gosh, Kristen. That is some story! Yikes! Perfect sear or not, these chops look incredible and the sauce sounds divine. This dish is gorgeous though! Love the flavors and the raspberry sauce is so creative! These look awesome! Love the sauce! Pinning! This is such a gorgeous dish! And the raspberry marsala sounds like it was totally worth it… and you’re right, it makes a great story at dinner! LOVE the flavors in this Kristen and the photos are beautiful (I want that little black, wooden spoon!) Sorry to read about your stovetop, what a horrible mishap, especially with all that company coming. I could totally dig into this for breakfast!! Looks fantastic!